10/12/88—Schaefer SuperGraphics has released several programs that just might help you live longer. Diet, Version 2.0 is a nutritional-analysis program written by two MDs. Features include the calculation of weight loss, daily caloric requirements and caloric expenditures due to exercise. The program also boasts an expandable GEM-based menu planner and calorie counter; ideal-diet and body-weight recommendations; complete documentation, including discussions on rational weight loss, debunking fad diets and updates on nutrition and exercise. Diet runs on any color or monochrome ST and is priced at $25. Longevity, an enhanced version of Diet, will teach you about risk-factor modification, nutrition and the advantages of sensible exercise in an effort to help you maximize your life span. The program performs all the calculations that Diet does, with the additional abilities to create nutritional databases, weight-loss calendars, nutritional profiles and more. There are 21 separate subjects covered, including aging, exercise, vitamins, cholesterol, aerobics, cancer, smoking and AIDS. Longevity runs on any color ST and retails for $39.95. 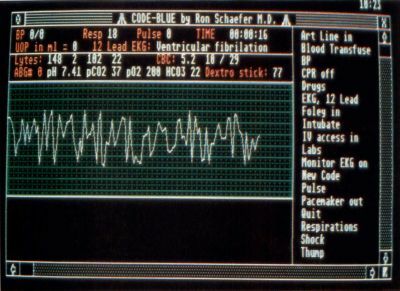 Code-Blue is a real-time simulation based on the most recent recommendations of the National Conference on Advanced Cardiac Life Support (ACLS). 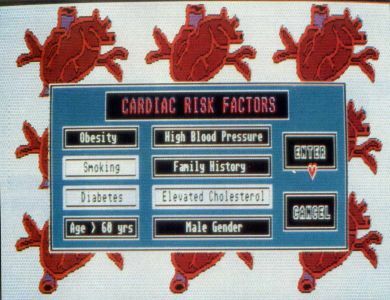 The program continuously updates such parameters as blood pressure, pulse, respirations, urine output, pH, pO2, pCO2, HCO3 and cardiac rhythm, and displays these graphically in real-time on the computer screen. The mouse is used to make selections from a menu of options that include drawing labs, procedures and administering the common ACLS drugs. Scenarios are generated either randomly or selected by the user, and no two are exactly alike. If at any time the user is unsure of what to do next, an artificial-intelligence mode may be activated, which can assess the current patient status and suggest the next appropriate step of ACLS. Code-Blue is priced at $65.95.